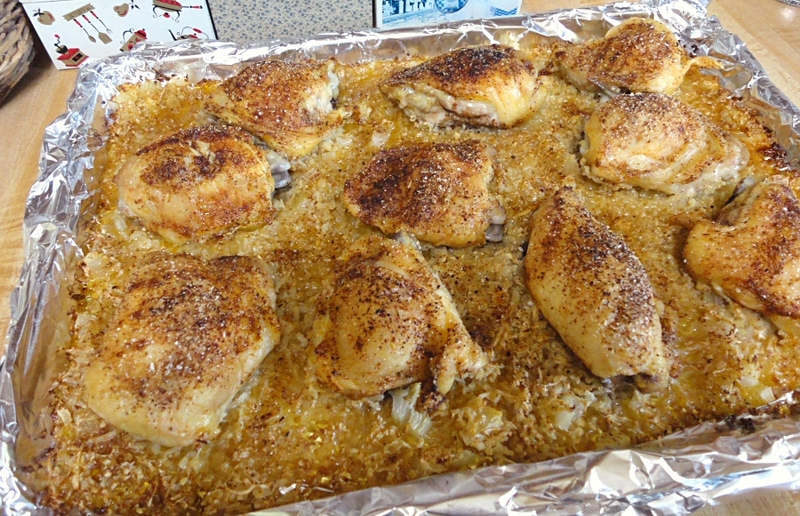 In the Kitchen with Linda: Chicken and "Rice"
I tried something on a whim today and it turned out very well. I was already planning to make roasted chicken thighs for dinner and I found a cauliflower marked down to 99-cents at Kroger. I ran the cauliflower through the shredding disk in my food processor to make "rice". I spread the cauliflower and a chopped onion over the bottom of a foil-lined baking sheet, seasoned it and drizzled it with a little oil. I'm not sure if the oil was necessary but I thought it might keep the cauliflower from burning before the chicken had a chance to release some of its juices. Next I arranged the chicken thighs on top of the cauliflower. I had already seasoned the bottoms of the chicken pieces and now I seasoned the tops. I baked it at 425º for about 50 minutes until the chicken was done. I wasn't sure how long the cauliflower would take to cook but it came out perfect in that amount of time and it was flavored very nicely by the chicken drippings. My husband liked it as much as I did.